The State of the Documentary Field initiative was shaped by the Center for Media & Social Impact, in collaboration with Simon Kilmurry, executive director of the International Documentary Association, with review also provided by Patricia Aufderheide, CMSI founder. CMSI affiliate researcher Bill Harder consulted on survey programming and also served as an additional data analyst. CMSI communications and program manager Varsha Ramani served as communication director and publication editor. Olivia Klaus, documentary filmmaker and graphic designer, created the report design. The State of the Documentary Field initiative is supported by an award from the National Endowment for the Arts' Media Arts program. The evolving digital era presents new opportunities for documentary makers and audiences as platforms shift, new storytellers emerge and media systems transform. Documentary has long enjoyed a vibrant space in the media ecology, and the marketplace for creative nonfiction storytelling continues to expand. Although the digital age began in the latter part of the 20th century, its practical implications have manifested for documentary storytellers and fans within the last 10-15 years--the era of YouTube, social media, streaming networks and accessible filmmaking equipment. Audiences are finding nonfiction stories in new ways, organizations have emerged at the intersection of documentary and public engagement, and a global community of documentary makers continues to grow. Despite an expansive landscape for documentary filmmakers and audiences, particular challenges are persistent. Questions about sustainable systems and sources of revenue that can support career-making documentary work are perennial. Issues of racial, ethnic and gender diversity require attention and scrutiny. As viewers continue to discover documentary storytelling across various platforms, and as new filmmakers enter the craft, tracking industry professionals’ perspectives and lived experiences is a vital pursuit. In 2016, in collaboration with the International Documentary Association, the Center for Media & Social Impact identified a need to understand documentary trends, as well as the motivations, concerns and perspectives of documentary industry professionals and makers at a moment of transition and opportunity. Sparked by this need and curiosity, we launched a pilot phase of this research in 2016, which was released at the 2016 IDA Getting Real convening. Two years later, this 2018 report reveals the first formal foray into this work. The State of the Documentary Field study will be repeated every other year. CMSI collected survey responses between January and June 2018. Respondents' participation was voluntary, and personally identifiable information was not collected. No financial incentives were offered or given. American University's Institutional Review Board (IRB) reviewed and approved the research protocol, and the survey was hosted online on American University's Qualtrics platform. 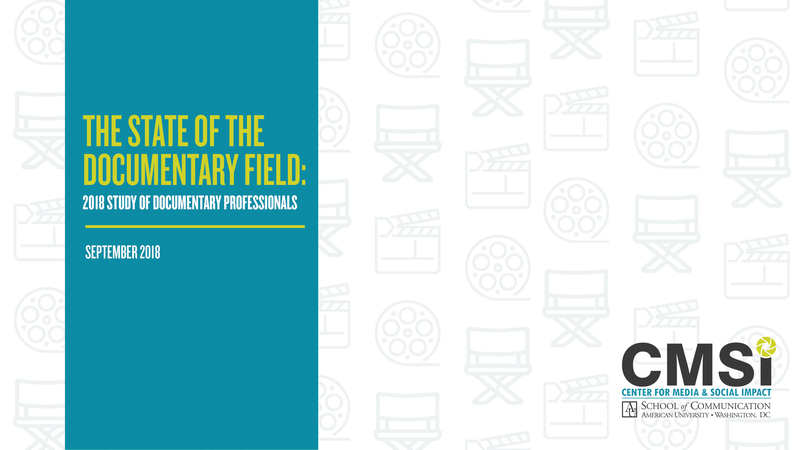 These survey findings are based the perspectives of approximately 550 documentary industry professionals. Based on a filter question that asked respondents to indicate their "primary position" in documentary, Part One offered opportunities for all self-described members of the documentary profession to respond; this group of respondents included those who identified their primary role as directors, producers, editors, directors of photography, as well as nonprofit professionals, impact producers or strategists, film-festival professionals, broadcasters, professors and funders. Part Two included questions customized for self-described directors and/or producers (that is, those who indicated that either "director" or "producer" was their primary role), given their creative, business, and financial decision-making roles in documentary work. In this way, we were able to ascertain film economics information and other insights from decision-making documentary filmmakers. About 335 directors and producers answered these "primary makers" questions. We analyzed the data to examine meaningful (statistically significant) differences between key demographic categories: race and ethnicity, gender and filmmaker "generations" (number of years in the documentary field). In terms of documentary filmmaker "generations," based on respondents' answers to a particular survey question ("How many years have you been in the documentary industry? "), we created two aggregate groups: "New Doc Pros" (those who joined the industry over the last 15 years), and "Original Doc Pros" (those who have been in the industry for more than 15 years). Where those differences exist, they are included here; if no differences were found between those demographic categories, they are not reported here. Documentary professionals are motivated by the future in their field, but they see room for improvement in terms of opportunities. Almost half of documentary professionals (48%) believe there are more opportunities for documentary makers now, compared to the last two years. When thinking about some of documentary's core values, the documentary professionals represented here say "the impact on social issues" is most meaningful to them about documentary work; 38% of documentary professionals gave this response the top billing. Maintaining an independent editorial and creative voice is also a core value and meaningful aspect of documentary work. The documentary directors and producers represented here identity strongly as creative individuals working to make a difference in social challenges. The majority of these primary documentary makers – directors and producers – describe themselves as social-issue advocate filmmakers (58%). Income from documentary work is inconsistent. About 4 in 10 documentary professionals (39%) say that less than a quarter of their personal annual income came from documentary over the past year. (We asked respondents to indicate: "Over the last year, what percentage of your personal gross income came from documentary work, as an estimate?") ("Documentary professionals" includes the full group of all respondents, which comprises documentary directors, producers, editors, cinematographers, festival executives, nonprofit organization employees, impact producers, broadcasters, funders and professors). For primary documentary makers (directors and producers), personal income from their films is low—and inconsistent. More than half of documentary filmmakers (56%) received less than $25,000 (as gross personal income) from their most recent documentary film. A combined eight in 10 documentary filmmakers (85%) received a range of less than $25,000 up to $75,000 of personal gross income generated by their most recent documentary film. Revenue from documentary film is inconsistent across documentary-makers (directors and producers). About four in 10 documentary filmmakers (42%) reported that their most recent film did not generate any revenue. Less than a quarter of documentary filmmakers (22%) reported that their most recent documentary film made enough revenue to cover unpaid production costs and make a profit. This pattern is more pronounced for documentary filmmakers from racial and ethnic minority groups, who were more likely than white filmmakers to report that their film did not make any revenue (49% compared to 35%). New documentary professionals are more racially and ethnically diverse. Professionals entering and/or newer to the documentary field—that is, those who have joined the industry over the last 15 years (we call them "New Doc Pros" in this analysis and report)— are significantly more likely to be members of racial and ethnic minority groups; almost 7 in 10 (69%) of new documentary professionals are members of racial and ethnic minority groups. More women are also joining the documentary profession. Seventy percent of the new doc professionals represented here are women. Women joining the documentary field are more likely to be women of color. For these respondents, more than half (62%) of women who have entered the industry within the last 15 years are women of color. Traditional linear documentary filmmaking still reigns over interactive or virtual reality – by a wide margin. Almost all of the documentary filmmakers in this sample (directors and producers) said their most recent documentary film was a traditional linear format (95%), rather than interactive (4%) or virtual reality (less than 1%). The majority of documentary makers (directors and producers) in this sample (58%) are currently making feature-length documentary films (90 minutes). But documentary filmmakers from racial and ethnic minority groups are significantly more likely to be making short-form films (18% makers of color compared to 7% white filmmakers), and less likely to be making feature-length films than white filmmakers (50% compared to 64%). The research is primarily focused on respondents in the United States. We did not restrict the survey from international respondents; however, a comprehensive international documentary examination should be a separate study, and one we hope to complete in the near future. That said, 10 percent of the respondents to this survey came from outside the United States, and they are included in the full findings reported here. Of international respondents (10 percent of the total sample), the highest proportion of respondents (between 2-9 percent of the international sample) originated from Canada, UK, Australia, Germany and Mexico. The remaining international countries include Bangladesh, Brazil, Chile, France, Guatemala, Jordan, Kenya, Netherlands, Norway, Philippines, Romania, South Africa, Spain and Switzerland. Because respondents were permitted to skip some questions, the exact number of people who answered varies from question to question, but not in a way that is numerically meaningful. In total, 679 people completed at least part of the survey, and about 550 people answered the majority of the questions; thus, the reporting and analysis here are based on the sample of 550. In this survey, we asked about and show the proportion of LGBT documentary professionals here in the demographic representation section. However, the sample size for LGBT documentary professionals was too small for deeper comparative analysis. Caty Borum Chattoo, director of the Center for Media & Social Impact, an innovation lab and research center based at American University's School of Communication in Washington, DC, is a professor, writer, documentary filmmaker and scholar. She serves on the boards of directors of Kartemquin Films and Working Films. Her book about documentary and social change is forthcoming from Oxford University Press.